What is the attraction of the used Hiace van? The japanese used car is also popular overseas. HIACE wagon is one of the most famous wagon vehicle in Japan. For decades, this simple yet practical wagon has been a choice for many, both in and out of Japan. 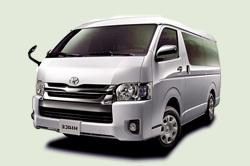 Depending on the model year, grades, and other factors, there are various types of HIACE wagon in the used car market. I think it’s important to ask yourself, “what am I trying to accomplish with this car” when thinking about buying a car. I myself was interested in this vehicle at one point and did my research on used cars. Even though I was looking at the same car, there were so many variations. For instance, some were worn out from years of hard labor, while others looked like they were new. Let’s look at HIACE in foreign countries. Since safety standards are different in each country, HIACE cannot be exported to North America. But in other countries, you can spot a HIACE from time to time. The GRANVIA body HIACE was sold in Europe. However, in 2012, due to the outdated designs, it is no longer in their lineup.